Last week PikPok set up a teaser site for an upcoming game that many people were guessing would be Into the Dead 2, a sequel to their hit 2012 first-person action runner. And it looked like those people were correct as today Into the Dead 2 soft-launched in the Australian App Store. During the very first cutscene in Into the Dead 2 the same walkie talkie and voices from the teaser site can be heard, so kudos to you if you guessed the teaser was Into the Dead 2 related. You win an internet cookie. I managed to hop onto my Aussie account and pick up Into the Dead 2, and so far it feels like it very closely follows the formula of the original but with a greater emphasis on story. Levels are bite-sized and there are a variety of mini-goals to complete during each level which will award you with stars. You’ll not only need to survive each level but also find weapon parts and ammo so you can upgrade your arsenal and take on the increasingly difficult zombie threat. The graphics are also quite nice and once again PikPok has nailed the eerie atmosphere of being in a total zombie apocalypse. 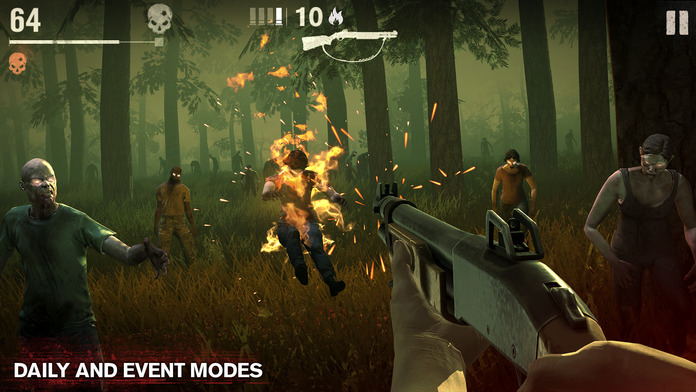 If you’re interested in giving the soft-launched version of Into the Dead 2 a spin you can grab it with the link below and discuss the game in our forums.